She's looking for a nice decent man. Someone who'll mow the lawn, flip chicken on the barbecue, teach their future children to play soccer. A young widow, Lucy can't risk that kind of loss again. But sharing her life with the cat Fat Mikey and the Black Widows at the family bakery isn't enough either. So its goodbye to her friend Ethan - her friend with privileges, and hello to a man she can marry. So let the dating begin. This is only the third book that I have read by Kristan Higgins, I am pleased to say I still have quite a few more of hers to read. Normally books that are written in the present tense and have a first person POV - I steer clear of them! This book has both, and it is so good that after the first page I forgot about my dislike, and by the end of the book I couldn't have cared less. It was just a great read. Lucy the heroine, comes from a family where the women seem to have bad luck with husbands - they die! Lucy has two aunts and a mother who have experienced that, plus she herself has too. They are known as the black widows. The older generation of them, plus the great aunt make up a set of characters who are quirky and endearing. Lucy could go the way of the older generation and never consider marrying again, however upon seeing her sister with her newborn baby she begins to consider another relationship. But with a difference. She wants them to be nice and somewhat interesting, but she doesn't want to really get involved with them. After all they too might die! As the story opens she has a great friendship with benefits with Ethan, the younger brother of her first husband Jimmy Mirabelli. She decides to end the benefits side of things with Ethan and put herself in the dating ring again. How does Ethan take that? Well you will need the book to find out. As well as Lucy's side of the family with all its quirky characters, there is her dead husband's family as well, including Ethan and his young son Parker. Lucy's family run a bakery where she is the chief bread maker, an excellent one too. However she wants to be a pastry/dessert chef, but her aunts and mother have always had their own way about that. Can she break that mold? Can she find a suitable husband and what about Ethan? Ethan's family run an Italian restaurant, although Ethan a very competent chef is not involved. His parents just don't seem to love or value him in the same way as they did Jimmy. This book just kept getting better as I read. My heart was touched with warmth at times and at others with tinges of sadness. I ranted at Lucy and wanted her to make the choices I wanted for her. ( She did eventually). I laughed out loud a few times and once went - "Oops, oh no!" The Next Best Thing is a very satisfying read. I really enjoyed it. I've got this one coming up soon. 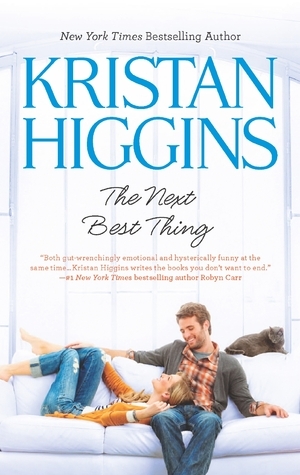 I love Kristan Higgins' writing and like you I'm slowly working my way through her list. This will be my 3rd or 4th book of hers. I met Kristan at ARRC in Brisbane earlier this year and she's just so lovely and funny in person. Oh how wonderful to meet her. I can't believe I bypassed her work for so long. It's nice thought to know I have quite a few to look forward to . Hmm must keep an eye on the ARRC!